When you are cooking something as simple as roast chicken, opting for a traditional method is often best. Such is the case with this roast chicken in Digoin terracotta roaster. 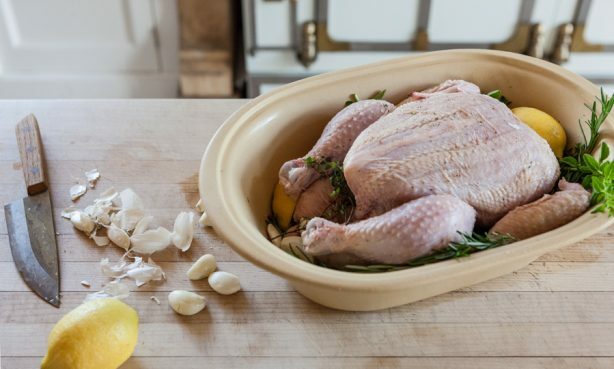 Ideal for roasting chicken, the traditional unglazed terracotta roaster utilizes one of the oldest known methods of cooking, dating back to Roman times. The high-domed lid allows air to circulate while keeping heat and steam in, resulting in a very moist, flavorful dish. We love to use Digoin’s unglazed terracotta roasters. They take on the flavor of your kitchen over the years and reliably result in an excellent meal. They are an heirloom in the making. For this recipe select a pastured bird that lived a regular chicken’s life, pecking and roaming around. You’ll be astounded by the difference in flavor — and this method really highlights it. Note: Before using your Digoin terracotta roaster you must soak both parts of the cooking vessel in cold water for at least 10 minutes prior to use. Also, the roaster must always be placed in a cold, not pre-heated, oven. To prepare the chicken, season the bird 1 to 2 days before cooking. First rinse the chicken and pat very dry. Using about 3/4 teaspoon sea salt per pound of chicken, season the chicken liberally all over with salt and the pepper, including inside the cavity. Twist and tuck the wing tips behind the shoulders. Cover loosely and refrigerate. When you’re ready to cook the chicken, wipe the chicken dry and set it breast side up in the terra cotta roaster. Peel the outer layers of the garlic to separate the individual cloves, but don’t peel the cloves themselves. Arrange the garlic, lemon, and herbs around the chicken. Put the lid of the roaster on and slip the pot in a cold (not preheated) oven. Set the oven to 425°F. Bake the chicken for about 1 ½ hours, or until cooked through, basting the chicken with its own juices every 30-45 minutes or so. If you have a meat thermometer, insert it in the inner part of a thigh. The chicken is done when the thermometer registers 180°F. If the skin of the chicken is still rather pale, remove the lid, and put the pot back in the oven for 10-15 minutes, until it turns brown. Transfer the chicken to a cutting board and let rest for 10-15 minutes. Carve the different serving parts, and transfer to a warm serving dish. Finish with SHED Green Salt and garnish with fresh herbs. Transfer the juices, herbs, and cloves to a gravy boat and serve immediately to pour over chicken and perhaps a side of mashed potatoes. Note: To warm your serving dish, fill it with hot water from the kettle previous to plating. Drain off and wipe dry. This entry was posted in Eat Good Food and tagged chicken, digoin, recipe.